SNAP Cats goal is to save lives of special needs cats. Whether it’s providing rescue and care, public education, or a rewarding volunteer experience, SNAP Cats offers a wealth of opportunity for everyone to become involved. At SNAP Cats, you’re more than just a “volunteer.” You’re a trainer, therapist and care giver to cats that need more than just attention – they need your love and commitment to help them overcome the challenges they face everyday. If you’re looking for a challenging yet very rewarding experience, SNAP Cats is your opportunity. All interested volunteers must attend a New Volunteer Orientation Meeting. Age requirements, qualifications, and hours for responsibilities vary and will be explained in the meeting. If you’re interested in any of the following positions please email us and we’ll inform you of our next New Volunteer Orientation Meeting. At SNAP Cats, you’re more than just a “cat cuddler.” You’re a trainer, therapist and care giver to cats that need more than just attention — they need your love and commitment to help them overcome the difficulties they face everyday. If you’re looking for a challenging yet very rewarding experience, SNAP Cats is your opportunity. As a foster family you’ll provide in-home care to SNAP Cats recovering from injuries/surgeries, cats in need of socializing (in a family environment outside of our campus), and possibly bottle feeding kittens who’ve lost their mother. Foster Care Families receive all animal care supplies for SNAP Cats and can determine the types of animals they are willing to care for. Click here to download our Foster Care Program Information. As a maintenance Volunteer you’ll assist SNAP Cats staff in keeping our campus clean and organized for our cats and the public. You’ll help by assisting with laundry, washing dishes, gardening, painting, organizing storage, general cleaning and various other tasks as needed. A clean environment is essential in keeping everyone happy and healthy. Drop off and pick up SNAP Cats from local venues (vets, mobile adoptions, events, etc. ), or longer distance transfers to/from other shelters, rescues and sanctuaries. Help our SNAP Cats get noticed/adopted. Photograph our cats to post on our website, AdoptAPet.com, Petfinder.com, SNAP Cats Newsletters, etc; update social media web pages; advertise our animals via the Internet; and create flyers/posters to be placed around your community to publicize both our cats and campus. As an Office Volunteer you’ll be responsible for answering phones, assisting the public, facilitating adoptions, and various other administrative tasks as needed. If you just want to help out in any capacity, that’s great, too. Whether it’s in the office, in our cat rooms, helping to transport cats, or working on your computer, we’ll always need and appreciate your help to take care of our wonderful cats. Our primary focus is to rescue and care for Special Needs cats that are scheduled to be killed anywhere in the world. Animal shelters, rescues and sanctuaries are full. Innocent cats are being killed due to lack of space and/or funds. The first cats to be killed are special needs, elderly and feral cats, or cats who aren’t deemed “adoptable.” That’s unacceptable. SNAP Cats rescues these cats, houses them, then finds them loving homes. We believe, if given a few more days or weeks or months, an older or special needs or feral cat can find the home that they deserve. All cats at SNAP Cats, regardless of health, age or temperament, are available for adoption or foster care. Those who are not adopted, due to age, illness or temperament, will be live out the remainder of their natural lives in a peaceful, healthy, serene environment, free from judgment or harm. SNAP Cats provides the community much needed information and education about often misunderstood topics, such as FIV, “feral” or “community” cats, and caring for specific special needs. This information is available on this website, and will also be discussed in free public classes at the future SNAP Cats facility. We are also available for free feline health and behavior consultation on most subjects during working hours. Now that we’re in our new SNAP Cats facility in santa Rosa, we will be offering the opportunity for group visits, i.e. school field trips, community groups and organizations. If you’re interested in bringing a group out to SNAP Cats please email us at info@snapcats.org. There is no fee to experience our wonderful world of special needs cats. Follow driver Nicole Jacque as she drives race car Team SNAP Cats in her quest for the checkered flag. Her schedule will be posted shortly, with results added after each race. Help support SNAP Cats by donating based on Nicole’s finishes. Pledge to donate an set amount for a first place, second place or third place finish. All donations go into the SNAP Cats medical fund. Thanks! FOLLOW OUR RESCUE OF MR. JEREMY FISHER FROM CAIRO! This is Mr. Jeremy Fisher. He will be arriving at SNAP Cats from Cairo, Egypt, on June 5th. Jeremy (Jerry) has mobility issues in his rear legs. It looks as if he’s swimming (hence the name, Mr. Jeremy Fisher). FOLLOW OUR RESCUE OF GINGIE FROM KUWAIT! OUR RESCUE OF FIVE SPECIAL NEEDS KITTENS FROM LEBANON! OUR RESCUE OF LIVINGSTONE FROM MOZAMBIQUE, AFRICA! Networking with their southern California contacts, SNAP Cats rescued three month-old kitten Andi, who has moderate+ cerebellar hypoplasia (CH). Andi would’ve been euthanized due to her condition. As you can see below, Andi is full of life (and very hungry). Thanks again to Pilots N Paws, especially Pilkot maurice, for flying little Andi to safety. In addition to our four webcams powered by MeShare, we’ve added a new camera and service in our kitten room. Click on the picture below to watch our kitties live and with sound on LiveStream. PLEASE NOTE: You have to register with LiveStream to watch, but it’s a free service. After almost three years of searching for the perfect location for the new home of SNAP Cats, Founder/Executive Director Darryl Roberts finally signed a deal on a house in Santa Rosa, CA. 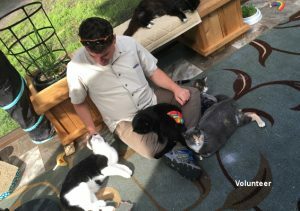 The house, which is situated on 2.25 acres off of Petaluma Hill Road, also presents SNAP cats the opportunity of rescuing FeLV+ cats, which is the goal Roberts set from the beginning. Once the new home has completed renovation, Roberts expects to double the number of special needs cats that SNAP Cats can rescue. Visiting SNAP Cats is currently by appointment only. Starting February 1, 2016, regular visiting hours will be set. The facility is offers free wifi, coffee, tea and all the love special needs cats can offer. For more information on SNAP Cats’ new home contact Darryl. Thanks. SNAP Cats introduces SNAP Wraps©, the stylish way to keep your special needs kitty dry and happy, while keeping your home clean and odor free. Our diapers are extremely absorbent, waterproof and machine washable, while our ACCESSORIES are light, durable and easy to clean. No more ugly disposables and snail trails on your floors. SNAP Wraps© are the smart and economical solution for you and your special needs kitty. Click on the image above to see our new line of SNAP Wraps©! As the sole beneficiary of all beverage sales, SNAP Cats raised more than $1,100 at the Summer Concert Series hosted by Montgomery Village (Santa Rosa). We couldn’t have done it with out the help from those pictured above (left to right): Michael, Darryl, Patti and Janice. They were awesome. Thank you! GRACE IS READY FOR ADOPTION! On August 17th, SNAP Cats rescued Grace, a two year-old DMH Tabby, from the san Francisco ACC where she was admitted with a broken pelvis in two locations, and neurological damage where she dragged her back legs. Through generous donations, SNAP Cats was able to care for Grace. We entrusted our uber tech team lead by Dr. Erin Bennett to nurse Grace back to health. And they did! Grace is now a healthy, happy cat and ready for adoption! If you’re interested in adopting Grace please email Darryl: darryl@snapcats.org. This segment is from the forthcoming yet untitled documentary on the rescue of Dmitri, a special needs cat that beat all the odds. A full-length documentary on Dmitri’s rescue will be available shortly. For more information and/or more video and pictures from this journey please contact Darryl. Thanks. Through a network of rescues (SNAP Cats, Kitten Rescue LA, and Ziggy and Friends Cat Rescue), volunteers, pilots and animal welfare advocates, SNAP Cats rescued a kitten with severely deformed rear legs along with her sister from the high-kill Downey Animal Shelter (CA). The kittens, now named Leia (deformed legs) and Lucy (non-special needs), arrived in Santa Rosa on June 21 via Pilots N Paws. It took three animal rescues, four volunteers, a foster care giver, and two flights to get them here, but we did it! Below is their first hour at SNAP Cats. This rescue would not have happened without: Renee Lauper for alerting us to Leia; Robin Collett who informed us about Kitten Rescue LA; Ben Lehrer, President, Kitten Rescue, LA who worked with us to get Leia and her sister, Lucy, out, and found a foster for them; Ziggy and Friends Cat Rescue who worked with Downey Shelter to get Leia & Lucy out; Eden Dambrosio who fostered the kittens; Amanda Lively who drove Leia & Lucy 100 miles Sunday morning from Burbank, CA to their flight in Riverside, CA; Pilot Bruce of Pilots N Paws who flew the kittens from Riverside to Modesto; Pilot Sue who flew the kittens from Modesto to Santa Rosa, CA. And Michelle Alyward who coordinated the flights for Pilots N Paws. It takes a network! Thank you! For more information please contact Darryl.